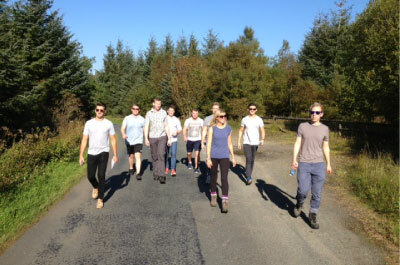 we took a trip up to Gisburn in Lancashire for a team building weekend away. We stayed in Dalehouse camping barn that was set in the heart of the country side with nothing but rolling hillsides for a view…which meant no TV, no phone or Wi-Fi signal, but luckily there were plug sockets for the 3 guys (not naming any names) that took hairdryers! We arrived in glorious sunshine so we put our hiking boots on and went for a nice long walk around the forest and nearby reservoir. We ended the evening enjoying a culinary challenge of producing a starter and main course with just £2 per person to spend. Despite the kitchen looking a tad worse for wear afterwards the result was a lot of very tasty food! On the Saturday we went to a local activity centre where we split into two teams to battle it out on the field so to speak! 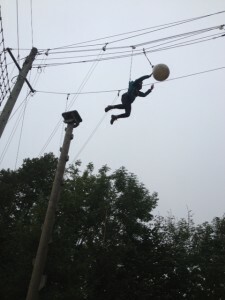 Activities just to name a few consisted of warming up with team plank races and number sequencing, building a campsite to a specification then to the more mentally challenging tyre tower of Hanoi and an archery session which was great fun. Then we progressed on to the more physically demanding crate stack, Jacobs ladder and leap of faith which definitely wasn’t for the faint hearted! They were a long way up but with the morale support from everyone else below, no matter which team people were in, it gave me personally the encouragement and push I needed to get to the top of the Jacobs ladder and take the plunge off the extremely small and wobbly platform on the leap of faith. In the evening we enjoyed a well-deserved meal out at a local pub which were luckily showing the England vs Australia rugby match. Despite the final score we had a great evening and got a rather unexpected lively ‘disco bus taxi’ back to the barn that definitely awoke anyone who was feeling sleepy! It was a fantastic weekend and it really highlighted the importance of working together, communication, shared understanding…and ear plugs, they were definitely needed to drown out a certain someone’s unmelodic snoring (not mentioning any names)!